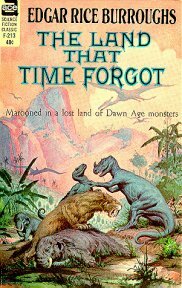 Taglines: The Land That Time Forgot ~ At The Earth's Core - a fantastic incredible world of savage mystery ~ A sequel to The Land That Time Forgot ~ The 7th continent - A lost world shut off by a wall of ice, roamed by beasts unknown to science, ruled by men lost to history, doomed to vanish in a chaos of leaping flames! Plot: A sequel to The Land That Time Forgot. 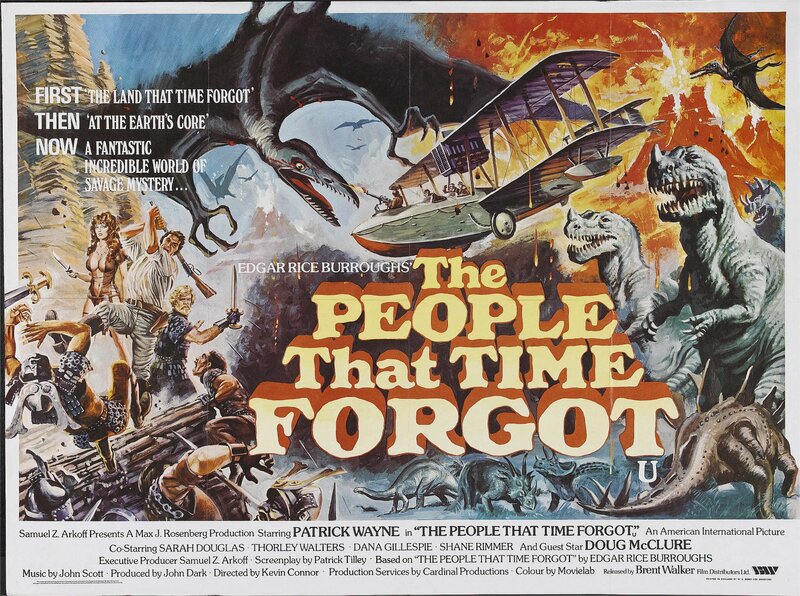 Major Ben McBride organises a mission to the Antarctic wastes to search for his friend Bowen Tyler (Doug McClure) who became trapped there along with his companion Lisa at the end of the first film, The Land That Time Forgot. The expedition, along with McBride's amphibious biplane, are transported to the coast of icebound Caprona by the Royal Navy ship H.M.S. Polar Queen, which can only wait at anchor three weeks before the ice closes in. 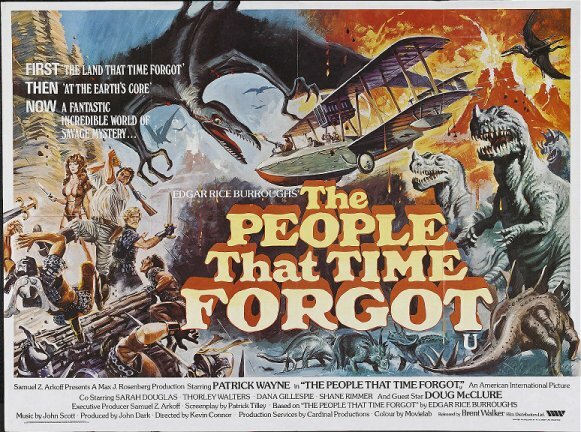 They take off in the amphibious aircraft to search the area for Tyler, but shortly after crossing the ice cliffs they're attacked by a prehistoric pterodactyl. Hogan blasts the flying beast with a machine gun, but the pterodactyl damages the plane, which McBride manages to glide in to a rough landing. Leaving Hogan to guard and repair the plane, McBride, Charly and Norfolk set off on foot to search for Tyler. 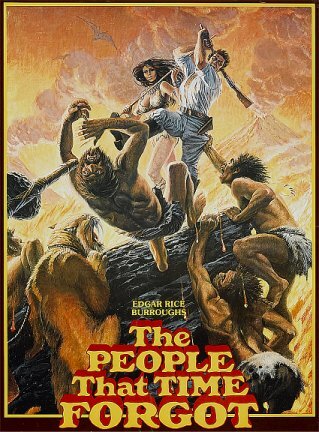 The first human they encounter is buxom cavegirl Ajor (Dana Gillespie), who astonishes them by speaking English which she had learned from Tyler. 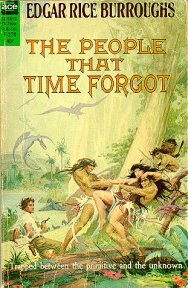 Tyler had lived among her people, the Ga-lu, until they were attacked and slaughtered by the evil Naga, an advanced race of bloodthirsty warriors who worship a volcano god. Only a handful of Ga-lu survive, scattered across Caprona and hunted by both the Naga and the Neanderthal-like Ba-lu. It's believed that Tyler himself was captured by the Naga some months earlier and taken to their capital, the dreaded City of Skulls. McBride and company decide to go there and rescue him if he's still alive. The party survives dinosaur and caveman attacks along the way until they are catpured by the Naga, who curiously are dressed in samurai-style armour. 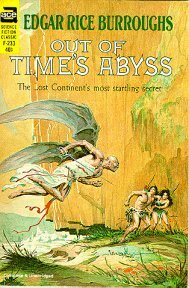 The girls are prepared for sacrifice to the volcano god, while McBride and the professor are imprisoned in a dungeon where they meet up with the bearded Tyler. 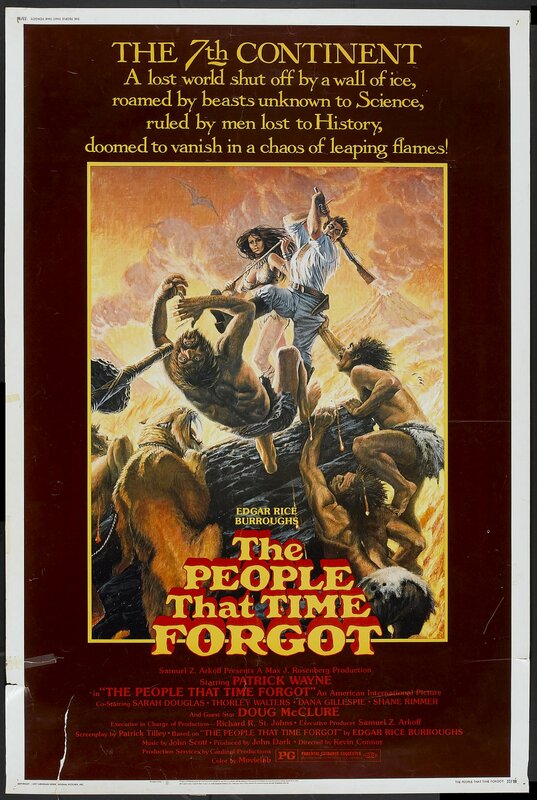 They escape, rescue the girls and make their way back to the plane, while the island explodes around them. 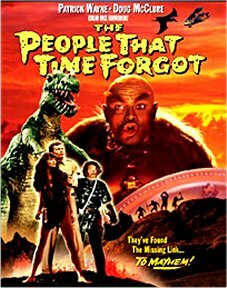 This film is probably the weakest in producerSamuel Z. Arkoff's 'ERB film trilogy': The Land That Time Forgot, The People That Time Forgot, and At The Earth's Core. Paintings by Frank Frazetta appear in the film either as murals on walls or as the inspiration for tableaux performed by the characters. The armored creature that attacks McBride and his group in the cave near the end of the film, was actually a model of the Late Permian reptile called Scutosaurus. Doug McClure made sixty film appearances between 1956 and 1995. He always seemed to have an eternal youthfulness. Doug was married several times, had two children, and continued to work during the last couple years of his life even though he was fighting lung cancer. Doug McClure died on February 5, 1995 in Sherman Oaks, California. When the heroes are making their escape from the Mountain of Skulls, and Tyler is holding off the archers with a pistol, one of the archers' arrows hits him squarely in the face and bounces off. Quotes: [hearing a dinosaur roar] Ben McBride: What is it, Doc? Norfolk: It can only be one thing. Prehistoric! [they hear another roar] Norfolk: Definitely prehistoric. [they hear a woman's scream] Norfolk: That's human. [Hogan is going insane and talking to his own reflection] Hogan: Hogan? Yeah? If I don't get outta here you're gonna go bananas!